Note : Your request will be directed to SignalCore. 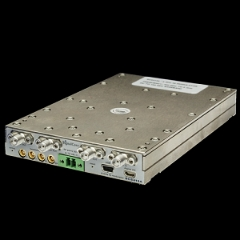 The SC5413A from SignalCore is a Modulator with RF Frequency 400 MHz to 6 GHz, RF Frequency 400 MHz to 6 GHz, IF Frequency DC to 160 MHz, P1dB 15 dBm (Input), Voltage 3.3 V (Logic Type), 2 V (Amplitude/Peak). Tags: Module with Connectors. More details for SC5413A can be seen below.